World-renowned University of Pretoria veterinarians Prof Gerhard Steenkamp and Dr Adrian Tordiffe this week performed intricate dental surgery on an elephant in Georgia, to remove its infected tusk. When Grand was transported to the Yerevan Zoo from Russia he fractured both his tusks, and had the left tusk removed in 2014 by a British team. Due to complications, the right tusk could not be removed. It became chronically infected and bacteria could have entered the bloodstream, which may have been life threatening. “Grand’s previous surgery had many complications. One of them was a protracted recovery time, and the zoo was reluctant to operate on him soon after that procedure,” Prof Steenkamp says. The surgery was not dangerous but was difficult and physically demanding. 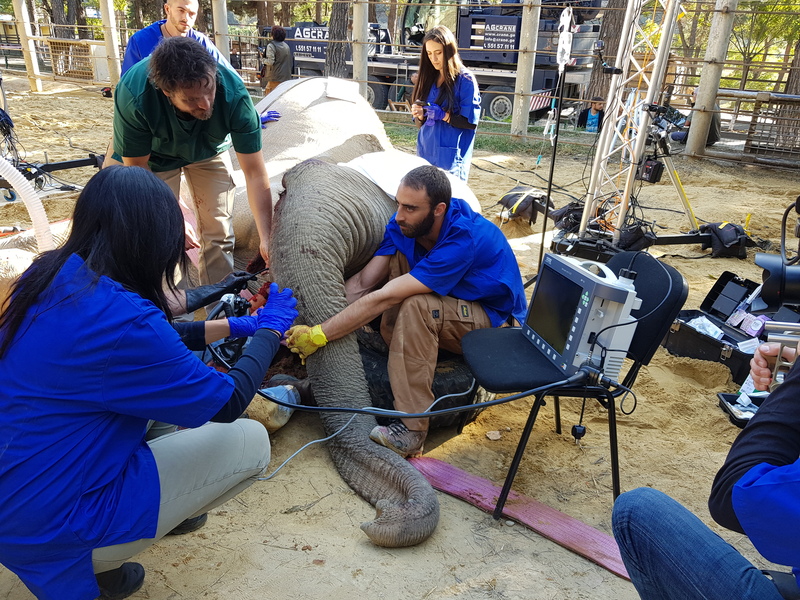 However, Dr Tordiffe, who gained experience in elephant immobilisations and anaesthesia while working at the Pretoria Zoo and has vast knowledge of anaesthetising elephants in small spaces, was the perfect choice to perform surgery on Grand. Prof Steenkamp has developed techniques to treat elephant tusks since 1998. Since then he was able to refine his methods and instruments, which is based on work he completed for his MSc on the morphometrics of African elephant tusks. The entire procedure from dart in to standing took four hours and 15 minutes. Of this, just over three hours was actually surgery time. 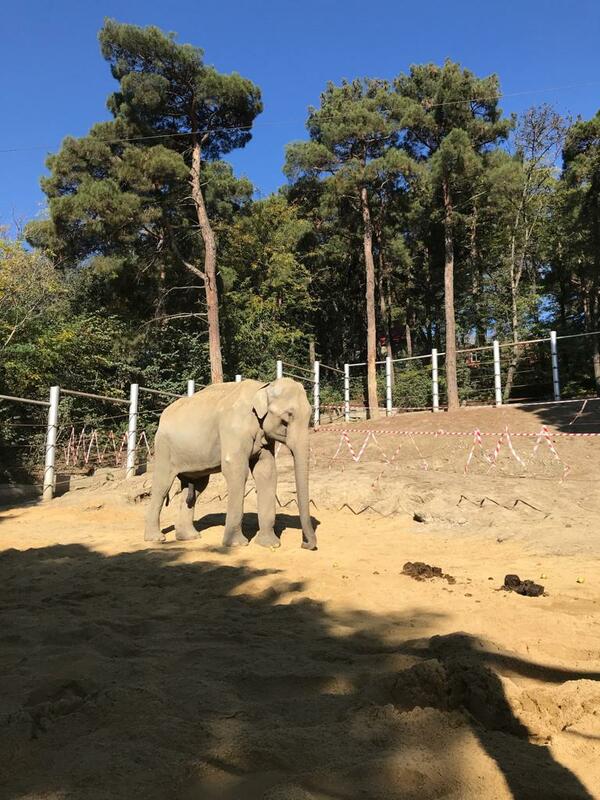 A crane was parked in the vicinity to move the 3,5 tonne elephant, in the event of it being in an inconvenient position for surgery, Prof Steenkamp explains. to remove his infected tusk. Dr Adrian Tordiffe with the ventilator as Prof Gerhard Steenkamp gets to work. 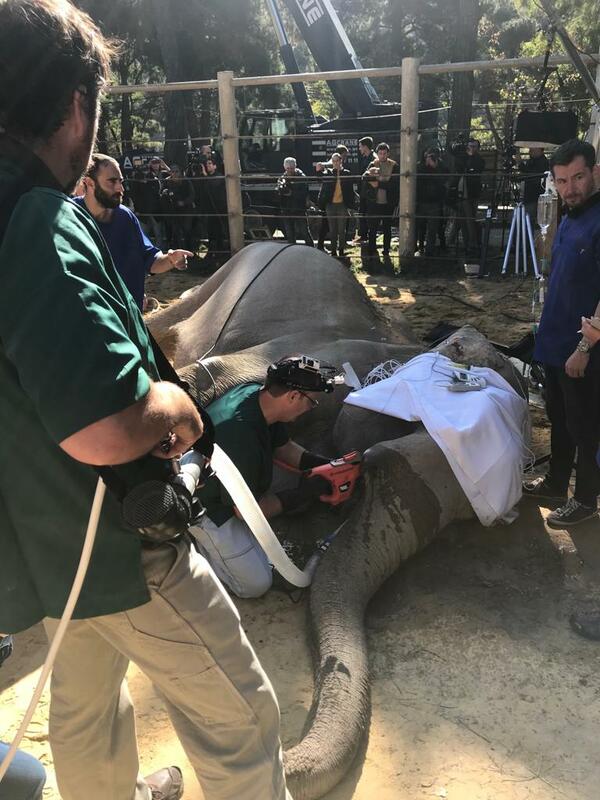 Grand has become a celebrity in Georgia, and on the day of the operation a crowd of international news crews descended on the zoo. The surgery was filmed by the BBC as part of their new series Big Animal Surgery. This procedure will be a main feature in one of three programmes. Prof Steenkamp also features in another programme, in which he performs surgery on a lion. “Elephant immobilisation is taken for granted in southern Africa, as our veterinarians are often called to perform these procedures. Keeping an elephant anaesthetised for long periods of time is not so common and to gain experience in this takes time. When we look to zoos elsewhere in the world elephant anaesthesia is not performed commonly at all. Dr Tordiffe therefore stands out as a leader in this field, and it is a privilege to work with him,” said Prof Steenkamp. Zoo and wildlife dentistry is in its infancy within the international veterinary community and here Prof Steenkamp is again a leader. He recently became an organising member of the Zoo and Wildlife Dentistry Certificate under the auspices of the American Veterinary Dental College. He is one of 15 people in the world who holds this certificate, which recognises vets with expertise in zoo and wildlife dentistry. His expertise in the field, especially regarding elephant teeth, is well established worldwide. He and Dr Tordiffe have travelled the world treating elephants in Australia, Asia, Africa and Europe. Dr Adrian Tordiffe (in green shirt) monitors Grand during the surgery.